Heat oven to 375°F. On lightly floured surface, unroll pie crust. With 4 1/2-inch round cutter, cut 4 rounds from crust. Fit rounds in bottoms and 1/2 inch up sides of foil tart pans. With fork, prick bottoms and sides generously. Place pans on ungreased cookie sheet. If desired, cut small star shapes from remaining pie crust pieces; place on same cookie sheet with tart pans. Prick stars with fork; sprinkle lightly with coarse sugar. Bake tart shells and stars 6 to 8 minutes or just until shells are dry and stars are golden brown. Meanwhile, in medium bowl, beat egg with wire whisk. Beat in 1/4 cup granulated sugar, the corn syrup, liqueur, salt and vanilla. Remove partially baked tart shells and baked stars from oven. Remove stars from cookie sheet. Arrange pecans evenly in tart shells. Pour egg mixture evenly over pecans. Return tarts to oven; bake 16 to 20 minutes longer or until crusts are golden brown and center is set. Cool on cooling rack 30 minutes. Remove tarts from pans. 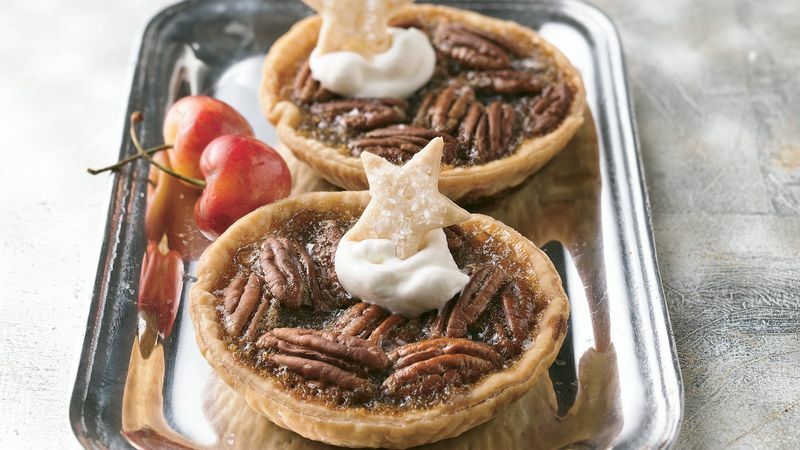 To serve, top each tart with whipped cream, and garnish with pie crust stars. If you don't have a 4 1/2-inch round cutter, use the top of a 4 1/2-inch diameter bowl as a pattern. Place the bowl upside down on the crust, and cut around the bowl using a sharp paring knife.